Self portrait by photographer (and bargain model) Cristian Baitg. How did you come to be a professional photographer…and how did you end up shooting stock? Well, after finishing my studies in Journalism I began freelance work as a reporter. Soon after, I founded a small business with another partner with the intention to keep doing photojournalism stories. To stay afloat we started to do events photography, which I didn't like too much, so I went on my own again. I started to work as a location scout for the advertising industry. Barcelona is a fabulous city with lots of diversity in a very short distance range, an appreciated quality by the production companies from all over the world that come here to shoot their commercials. Eight years ago I started to send some images, basically travel images, to some stock agencies and slowly started to learn about this new opportunity. After joining Getty Images my revenue escalated fast and I began to wonder if I could live from this alone. This final step was done two and a half years ago and here I am. I see that you were once a journalist. I too started out to be a writer, and now over thirty years later I can look back and appreciate how my literary education helped my photography. How has your journalism background influenced your photography career? Today I am a photographer because I started the journalism degree pushed by an idealistic view of the profession. I wanted to be a reporter in turbulent countries and change the world with my pen. I remember that in my third year of university a friend showed me how to develop film and paper in the dark room. I was so in awe when I saw an image slowly forming from a blank paper inside the developer that I knew from that moment that the pen had lost forever against the camera. I studied photojournalism along side my university studies (as weird as it seems, at that time there were no photojournalism classes in all of the university courses). When I graduated as a journalist I did what I ever wanted to do, that is, explaining stories in pictures around the globe. Now I am a stock photographer but in my heart and soul I will always be a photojournalist, though the way to financially support yourself and family with this route is much tougher than stock has ever been for me. Slowly my stock career is funding again that kind of photography, without the financial pressure I once had to deal with. Another point that has influenced and helped my photography a lot is curiosity, a basic instinct that constantly wants you to know more and more. It's what's journalism is all about, to find the right answers. This maxim has built my way of thinking and searching until this day. From everywhere. I love seeing all kinds of images from online magazines to photography groups/sites, social media pages, the websites of other photographers stock sites, documentaries, films...I am a compulsory image consumer. Can you share your approach to doing a stock shoot (how you prepare, a little about your work flow and that sort of thing)? In reference to studio sessions, once I settle on a subject I let my brain roll to come out with all kinds of images around this theme and write those down in a list. I know that many more will come once I am in the middle of the session, but those initial ideas are a good guide for my shoot. Next is the buying phase, which I hate, and where I have to find all those props needed for the shoot. When I have all the material together I photograph them in my studio. Then I do all the editing, post processing, key wording and uploading myself. When I do travel photography I research the country where I am going and try to locate the clichés of that country/city (skylines, landmarks, etc.) that will hopefully recover my investment. Once I have tracked and photographed those, I feel much more free to photograph what I want in the destination without the financial pressure. For example, in a trip to Hong Kong last year I photographed for two days the night horse races, which is a very big and stunning event in this city. Those images are still unpublished as I cannot send them anywhere because of the lack of releases, but I had already captured other parts of the city that will hopefully cover my visit there. I don't regret for one second to have taken those images even if I knew they would not bring a single dime in the more immediate future. In this new era of stock photography it can be important to keep production expenses down. How do you manage to get the most for you money out of a shoot? Nowadays, more than ever, I believe this is the key point for being successful. The explosion of supply, and the downward price pressure that has come with it, has cut budgets to the bone. A few years ago I moved with my family to a small town 35 minutes from Barcelona. Once here I could rent a much cheaper studio that would never been possible in an expensive city like Barcelona. That has been the first and most important step to keep costs down. My biggest expenses are props, but once I decide to concentrate on a subject I try to maximize those props with different ideas. I understand that you started photographing “traditional” stock for Getty, but more recently have put your efforts into microstock. Can you share what motivated you to transition to microstock? I entered Getty through the Lifesize collection and was later offered a PC contract. At the beginning it was great as the return per investment, including the placement fee (with Getty PC a photographer is largely unedited, but pays a fee for each image included), was quite fast but this deteriorated very quickly and as I shoot a lot, the risk was growing, the upfront fees were becoming a barrier and the rpi (return per image) fell too much and too quickly, so I started to look for other options. I was intrigued by micro and some numbers in blogs and forums made me jump in and test the waters. At first the results were not that spectacular but I wanted to see if this would change by going “exclusive”. If that didn't work out I would have quit, but that was not the case and from there on the growth has been quite impressive. I recently heard that you now earn over twelve times as much with iStockphoto as you do with Getty. Is that accurate? Can you share with us some of the factors that have gone into that change? This number has resulted because the last month I had the worst month I remember since many years in Getty vs. an average month in Istock. For this growing difference between my Getty and iStock income a few factors come into play. For the last two and a half years since I jumped into the micro arena I have produced very few images for Getty and concentrated all my efforts on Istock. I now have 4 times as many images in Istock compared to Getty, although many more similars too. Istock prices have increased substantially since I started, while on Getty the contrary has happened. Another point is the percentage I get in every agency. I am now at 40% in Istock and 20% in RF and 30 %RM (40% home country) in Getty. So even if I have the opportunity to send free images to Getty RF I prefer to send those to Istock as I see a recoup of investment much faster. And then comes the most important factor that can break or succeed any portfolio, but is also the most elusive one: the image placement algorithm. We all know that the best image placed on page 10 on any given search result is a dead fish. Those rankings are difficult to analyze because it's kept secret so that nobody tries to beat the system, and also because the algorithms change a lot. It might be that iStock gives me a better ranking to my images than Getty. I remember that when I became exclusive with iStock, when a ranking boost is applied to the new exclusive contributor images, my earnings multiplied by eight in the next month, part of this is better commissions and higher prices and part of this better placement. What is the average amount that you receive from an iStockphoto download? The average net amount I receive now from an iStock download is $5.50. This depends on where you stand in iStock. Vetta and Agency shooters have a much higher average while non-exclusives have a much lower one. You now have over 5000 images on iStockphoto, which you created over a span of less than three years. You are amazingly prolific! How do you manage to create so many images? Hahahaha. No secret here...working, working, working. But the kinds of images I submit to iStock are quite simple to craft and I also send lots of similars that quickly brings the total number up. Do you have any concerns, in producing so many images, that you are “cannibalizing” yourself? No doubt this happens a lot, but regarding similars, it has been my experience that although there is usually one of the lot that stands out and gets many more sales than the others, my approach has been that I don't know which will be the one that hits the jack pot. I get surprised over and over again, so I am more prone to sending too many than the opposite. Also, because of composition and copy space orientation, buyers can pick up whichever image best suits their needs. And when I repeat a successful image or concept with slight variations I’d rather "cannibalize" my own sales than have another photographer do it. Of course, this system of work comes at a price. As your sales become more diluted among a set of similars it's more difficult for one image of the set to increase in ranking (because of number of sales) and get a better search placement. Here we are again with the dilemma of what's better: One image in page 1, or 20 similars spread out in farther pages. No doubt the best is to have one image that stands out on page one with a lightbox that links to all the other similars. That is what I always try to accomplish…not an easy task. You have images with Getty and iStockphoto. Are your images represented elsewhere, or do you plan to add more agencies? My images are now with Getty Istock and all the partner sites of the Getty conglomerate. As an Istock exclusive I cannot send any RF images to the competition. But I plan to market content as RM in the future. Mostly editorial content that I cannot move because I don't have an editorial contract with Getty and the restrictions of iStock editorial collection that are quite tight (for example, I cannot submit any editorial image taken inside any property without a release). Do you license any of your own stock photos? Not now, but if I try to sell those editorial images I might try to sell direct via a platform like Photoshelter. What do you think it takes to be successful in microstock? Different approaches succeed in the microstock arena. There are photographers that spread their images across dozens of micro agencies. You don't get the exclusive benefits that some agencies offer but on the other side you can sleep much better at night because if an agency underperforms for whatever reason you are still covered by all the others. Then there are photographers like me that prefer to be exclusive with one of the two micro leaders because a variety of incentives that include: Priority in image placement; Higher prices; Higher commissions; A variety of image collections with different price points; And the time you save in complying with a specific set of rules instead of satisfying a variety of requirements of other agencies (time which you can use to create new images). In iStock you see photographers that are not volume prolific but create more creative images for the top collections (Vetta and Agency) and do very well. Then there are people that although are not creating for those top collections, are able to produce best sellers and achieve many thousands of downloads with fewer images. My approach is to supply a variety of subjects in good amounts and it's a strategy that is also working quite well. Nevertheless, I am well aware that only a tiny minority is able to make a living from microstock. Although possible, it is quite tough to succeed with micro. What would you change about microstock if you could? Contrary to what many microstock shooters believe, I think the policy of Istock regarding different collections with different price levels is absolutely right. I would introduce even more. There are images that because of execution or rarity are worth much more than the present top collections value them, and there are others that because of repetition could be priced even lower. I would also like more price segmentation in the editorial collections because of the same reasons stated before. Better filtering of images would also be good. With millions of images it is increasingly difficult to be seen, and I think all those images that don't sell (I have plenty of them) should disappear. Of course some amazing pictures could be lost this way, but all in all, the collection would be much stronger than it is now. Do you think it would be wise for other traditional stock shooters to shoot for microstock? It depends.... You need to sell an image many times to make it work. Rare images, or those with low demand, are not going to pay the bills in micro. If you create high demand images it works very well because the market reach in volume of customers is much more powerful than any macro agency, Getty included. If you are not into this kind of imagery I think macro is a much better option. Do you think one needs to shoot differently for microstock than for traditional stock? Yes, absolutely. In traditional stock, especially RM, you can take many more risks and experiment more. A low interest subject well crafted might sell once and return 20 times what you invested in it. That's simply not possible in micro. There is a good reason why those agencies are overstuffed with cliché images and Getty is still much more diverse. Have you had any problems with other photographers copying your material? Yes, it happens because the sales data are available to anyone and everyone. I like Getty much better in this aspect where this sales data is kept private. Do you still shoot assignments? No, and I am very happy about it. It's been two and a half years since I quit my job as a location scout, always working on deadlines and without the freedom to organize my time, something that is invaluable to me. I will not go back to assignments unless I have to. Are you involved in social media, and if so, in what ways? Not from a business perspective. Of course I have personal accounts in the most known ones to stay in touch with friends, and I even have a photography page in Facebook where I post more news related to photojournalism and social photography than stock, but I have to dig deeper in the future. I strongly believe in social media. How important is your web site to your business? Embarrassed to say it but have not updated it for years now. In my case I don't think that my selling power in stock increases with a better website because my stock work until now has been too generic, and as I also don't do assignments it would be not efficient to spent too much time on my web. That doesn't mean I consider web presence secondary for photographers at all. I know you spend a lot of time with your website, but you also have very unique images that can be promoted for visibility to later get the sale through one of your distribution channels. For specialized photographers, or those with a very unique body of work, continuous Web development and optimization might well be a necessity. As I am growing my editorial collection, and if I start to sell directly, I am thinking about showcasing it on a new redesigned web site. Several of my photographer friends have indicated that the higher price-point stock offerings such as iStockphoto’s Vetta and TAC (The Agency Collection) have really boosted their revenue, and yet many microstock photographers have been unhappy about the rising microstock prices. What has been your experience in this regard? The problem is not one of rising prices. The problem is to set the right price for each image. If you ask the customer to pay 15$ of an isolated apple it might be a fortune considering that there are much cheaper options, but some images from Elena Vizerskaya among other great microstockers, are a bargain for 100$ or 200$. And I think the buyers are well aware of that. When I look at your body of work I am struck by the diversity you have.You shoot people, landscapes, travel, food, animals and concepts. Do you think part of your success is due to your versatility? Since I entered stock photography I have experimented a lot to understand what sells and what returns I can expect on different subjects and themes, and after all this time I am beginning to get a clearer picture about what succeeds in this game. My versatility is a strong and weak point at the same time. Strong, as I am not exposed to one subject or style (and if the demand of these decreases I have always other images to offer), and weak in a way that as your knowledge and skill about a given area is more limited than the specialized competition, it's much harder to stand out in those areas. I can tell you that what I really love, and would like to specialize in is photographing real people in real environments. But right now the returns I am seeing from this type of photography are not enough to concentrate in this direction, although I am getting closer. I also noticed that you can be pretty thorough at covering a given subject…how important is that approach in microstock? Regarding similars, if your shoots are not post-processing intensive, giving alternative points of view and a variety of compositions to your potential buyers is a fast and easy thing to accomplish. Once you purchase props or use models, why not make the most out of it? I have seen similar images where one has sold 100 times more than the other when the differences between the images were really minor. As I don't know beforehand which version will sell the best I send a wide selection in. I always have time to delete later those that don't work well. In macro the similar policy is much stricter and the ability to delete images later more complicated. In the case of RM images, too many similars dilutes the value of exclusivity. I have always valued my stock career as a lifestyle as well. Looks like you might be doing the same thing. Do you choose a destination with shooting stock in mind, or shoot stock at whatever destination you happen to reach? Mostly the second option. I choose my destinations because I have a personal interest in them and from this point I try to make the best out of it. For me travelling and seeing the world has been, and is, a basic need. Until now it represents a small fraction of my revenue but I would like to expand and grow it more. I see my studio work more like my daily job, while when I hit the road with the camera it's another thing, a mixture of personal search and satisfying my innate curiosity. The business side of the equation is not that important. But as my intent is to dedicate more time to travel I will have to take more attention to this later part. I definitely agree that stock is a lifestyle. Of course there is a lot of work, but in some way you feel so free to be on your own, with nobody above you to tell you what to do. I think this style of life is very close to what I would define as ideal. Do you have any plans to get into motion stock? Not in the near future. I enjoy still images too much to change to motion and also I see the learning curve for motion as quite steep. To master this medium is amazingly difficult. So I am not ready for this move yet. What is the one most important piece of advice you could give stock photographers? To experiment and try different approaches all the time. We are in such a fast paced world that what worked yesterday doesn't work anymore today and the adjustment we make now might not work tomorrow. When I look back at my first CD Rom sent to a stock agency eight years ago, to where I am now, I realize I have tried many things and most of them didn't work out the way I expected. I am sure that in a few years my situation will have turned upside down again. The future of stock photography…are you optimistic or pessimistic? It's also a bit of both though I want to believe that the music is still going to be played for a long time until the Titanic sinks. Competition is fierce, true, but image demand is bigger by a huge margin than has ever been before. At some point this huge supply will just level off. There are some types of images that are out of reach by the vast majority of stock producers and will always have buyers. Your amazing work is a perfect example of this. The more simple images that many are producing had and still have huge revenues, taking into account their simplicity, but the high returns for these kinds of images might not happen again. That system is still working now, but at some point it will not, and many photographers will throw in the towel if they have not found an area where they excel. So for now, generalists are still doing great, but I truly think that the future will be for the specialists. So my clock is already ticking. Another point of concern is the concentration of the stock industry. With libraries having millions of images it is very difficult for newer alternatives to gain enough traction to rise to the benefit both buyers and artists. If the few large players of the market merge together at some point (and with huge investment groups moving the strings behind the curtains), it will not be good for us. In any case, the infancy of Internet makes it very difficult to predict the future. Tomorrow something new might again shake the established system so I am much more focused on the present. Can your share a favorite image and the story behind it? I will always remember this image because I hit my head during the photo shoot, not from falling off of the flying carpet, but because in the stress of the shoot I knocked my head against the counterweight of my boom… a very painful experience! I have, from early childhood, loved fantasy and science fiction books, comics, and films and always wanted to photograph a fantasy-oriented subject. Once I decided that sultans and flying carpets were the chosen theme I begun solving the problems for the session. The first thing was to get the full moon. I rented a 500 f4.5 and a Canon 7D (for the 1.6x) and waited for the perfect night. I remember going up to the Turo de l'Home, the highest mountain around Barcelona at 1712 meters. When I arrived at the top at 3:00 am I was surrounded by clouds and obviously totally alone. As the atmosphere was quite creepy and the clouds didn't dissolve I decided to go down again, disappointed. But when I arrived at the base of the mountain the sky opened up for some minutes so I stopped the car, quickly set up the tripod and I was able to get the needed picture. The models were easy, my father and I. I knew my mother was not going to be happy seeing an image of my father trying to stab me but…we are both Mediterranean so our darker skins could fit into the characters, we were gratis, and if you see my portfolio, I use a lot of family members or friends. I feel more comfortable and have a great time with them. We posed against a white background to be cut out later. The outfits were partly rented and partly bought. 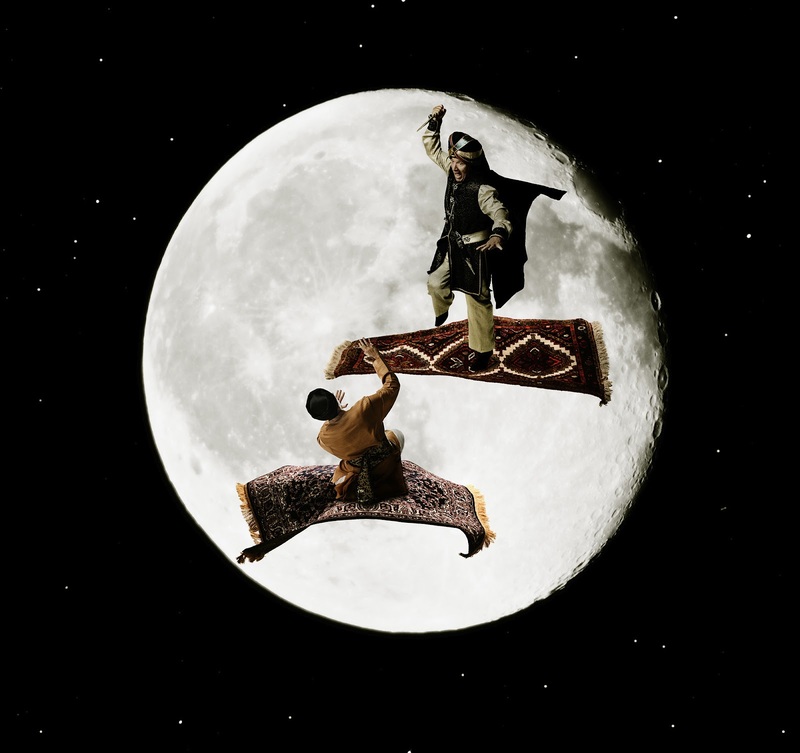 At first giving the flying carpets movement gave me some problems. I tried using an industrial fan but it did not have enough power to move the carpets, then tried attaching the borders with nylon strings while two people were moving them, which didn't work either. Finally we just threw them up in the air while I was taking the shots. As usual, the simplest solution worked the best. The final integration was long as I masked models and carpets out manually and (voila!) got the final fight between two rival sultans under the light of the moon. I really enjoyed this session, and the pictures that came out of it, and would love to repeat with more fantasy oriented ideas, though they have not been as successful with revenue as other more mundane subjects I have done. Thanks to both for interview! Several comments confirm that unreleased RM remains "safe" from micro in-depth coverage, AFAICT. Good article! looking at the portfolios at Getty and Istock, there is a big differance. The portfolio at Istock is far more commercial and yes, it would sell a lot better. I wonder why he has placed just "ordinary" shots at PC ? Perhaps because that is his older work? Yes ofcourse it is! I was curious because I supply the Getty house collection and PC, with RM material and PC, seems to sell extremely well. Cristian really smacked the nail on the head with the importance of the sort order. Thats the whole key to it all. Couple of year back I would never have dreamt of exclusivity but the way things are going, photographers with big portfolios are dropping out of independancy, agencies are changing the sort to benefit nobody but themselves. At least IS have changed to benefit their exclusives. Cant blame them for that. Independancy have turned into a poker game with ones livliehood at stake. thanks! it was a kind of eyeopener.